"These pianos reproduce sound in a way that envelops the user as never before. 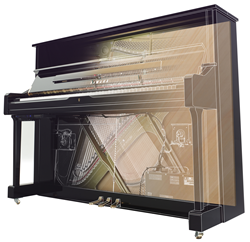 You can perform with a digital sound generated through the piano's soundboard with full volume control, or even combine the acoustic piano sound," said Jim Levesque, Yamaha. Yamaha recently expanded its groundbreaking line of TransAcoustic pianos with two new grand models — the C1XTA and C3XTA— and three uprights — the YUS1TA, YUS3TA and YUS5TA. These new instruments bring the number of TransAcoustic models to seven, offering more piano size options to choose from. ● Ability to layer digital sounds with acoustic piano sound.